These dog carriers are the perfect combination of convenience and style. It is designed to take your pet traveling with you by offering both strength and comfort for pet lovers on the move. Your pet will love the cloth material. This style bag will keep you and your pet relaxed and comfortable throughout the day. This bag will give you and your dog a comfortable experience. It can also be carrier bag for cat, rabbits or other similar pets. 1. As a pet carrier front pack, take your pet everywhere,bikes, hikes, subways, shopping, motorcycles, skiing, dancing and so on. 2. Special design let your pet feel comfortable while keeping your hands free; This backpack also folds flat for easy storage. 3. Breathable mesh won't make your dog feel stuffy or uncomfortable in the pet bag. 4. Built-in traction clasp can lock on the dog's collar that prevents your pet ran out of the pet carrier. 5. 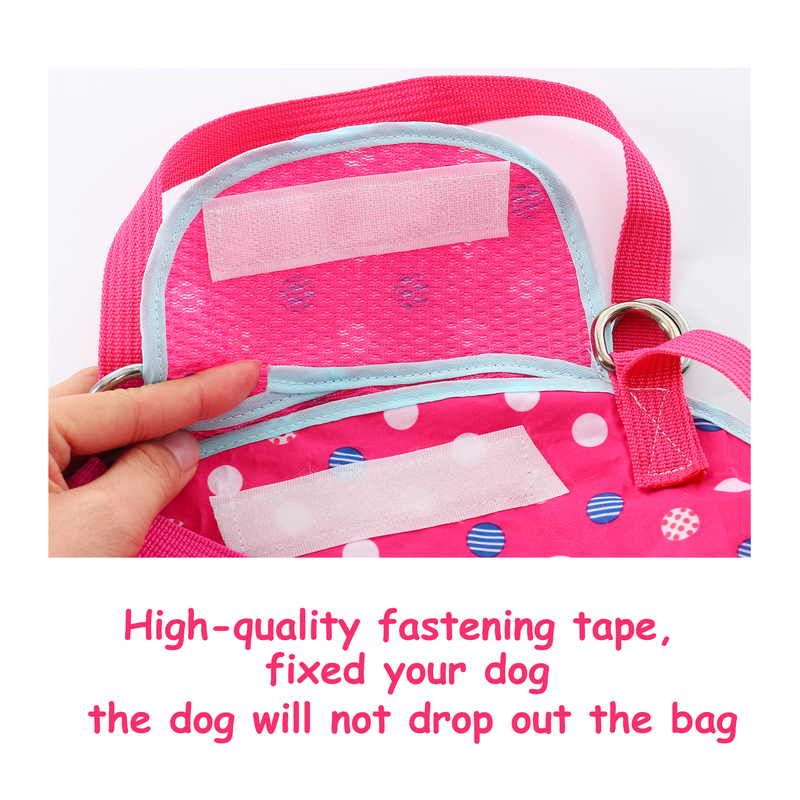 Using this backpack when you go out with your pet, will more convenient and more concise. 6. This bag is comfortable and breathable, sturdy and durable, can machine wash or hand wash.
7. For extra comfort, we鈥檝e widened the straps and added the shoulder pads. S: Total Length: 24cm/9"; Long (Front leg to Rear leg): 12cm/4.7"; Width (left leg to right leg): 9cm/3.5", Max. Neck Circumference(Adjustable): 27cm/11"; Load Capacity: 1Kg/2 pounds; Strap Length: 58-114cm/23"-45"
M: Total Length: 30cm/12"; Long (Front leg to Rear leg): 14cm/5.5"; Width (left leg to right leg): 11cm/4.3", Max. Neck Circumference(Adjustable): 32cm/16"; Load Capacity: 2.5Kg/5.5 pounds; Strap Length: 58-114cm/23"-45"
L: Total Length: 34cm/13"; Long (Front leg to Rear leg): 16cm/6.3"; Width (left leg to right leg): 12cm/4.7", Max. Neck Circumference(Adjustable): 36cm/14"; Load Capacity: 3.5Kg/7.7 pounds; Strap Length: 58-114cm/23"-45"
XL: Total Length: 40cm/16"; Long (Front leg to Rear leg): 18cm/7.1"; Width (left leg to right leg): 14cm/5.5", Max. Neck Circumference(Adjustable): 43cm/17"; Load Capacity: 4.5Kg/10 pounds; Strap Length: 58-114cm/23"-45"
3. Size just for reference. Variability of 1-3 cm is possible due to measurement process, please make sure you do not mind before you bid.